Many people now carry more than one device with them and with every device comes a cable. There’s no getting away from the wires, but it’s worse still if you’re running both iOS and Android devices at once. 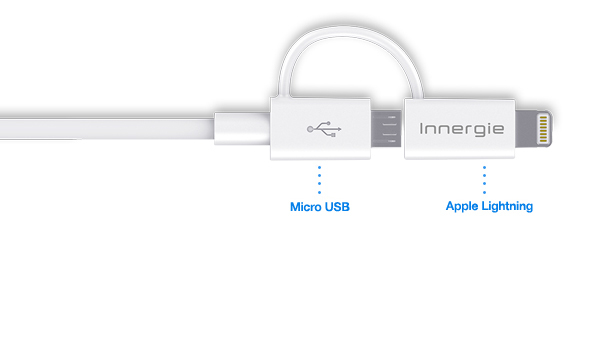 Innergie’s 2 in 1 MagiCable Lightning Duo offers a neat solution to carrying multiple cables for charging and syncing by combining them in one simple cable. While other cables that offer dual charging are often just two cables strung together or different tips that get lost around the house, the Magicable tries to make pockets less bulky by combining them in one cable and allowing you to flip from the Lightning connector (iPhone 5, iPod Touch 5 and all new iPads) to the Micro USB hidden carefully underneath, with both staying connected to the cable. A cable may be a basic thing, but anyone who has witnessed the auto-spaghetti effect that occurs when several of the things meld together inexplicably in your pocket when left alone will be able to see the advantage of this new device. It even has a nifty cable tie on it to keep the cable tidy and free of knots. 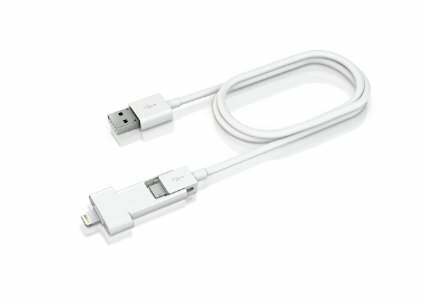 For those with older iOS devices, the company also makes the Magic Cable Duo, which has the same Micro USB but with the older Apple connector. Having now used this in place of my usual cables, it has become an essential piece of kit to carry around with me and provides good speeds for data transfer on both Android tablets like the Nexus 7 and the iPad, as well as charging the fussy iPhone 5 without any warning messages or issues. The 2 in 1 MagiCable is now available direct from Innergie or stores like Amazon in the US or Dixons online, Staples and John Lewis stores in the UK.